I normally post my Mash-Ups on YouTube. But since I've rarely post anything there, I'm going to try and post them here. "After playing Sonic Mania Plus for a while, I was piecing together what other song goes well with the Encore File Select theme. 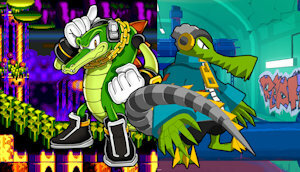 What better way to play it than have these cool crocodiles represent their respective games. Hope ya'll enjoy!"